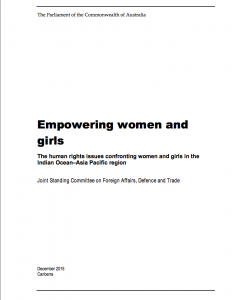 Improving women’s health and education, and promoting women’s economic empowerment and their leadership in the Indo-Pacific region are topics covered in a report released by the Australian Joint Standing Committee on Foreign Affairs, Defence and Trade (JSCFADT). The report contains 33 recommendations which address the key areas of inequality discussed in the report: women’s legal empowerment; the incidence of violence against women and girls; improving women’s health; education as a right for girls; promoting women into leadership roles; and women’s economic empowerment. The third recommendation was co-developed by CPC affiliate PUSKAPA (through AIPJ funding) with civil society partners such as PEKKA, indicating their endorsement to expand the investment around birth registration: "The Committee recommends that the Australian Government encourage the Australian Courts to expand their investment in the work of making the registration of marriages and births more accessible in Indonesia; and expand its efforts to pursue similar work where it can facilitate reform in other countries in the Indo–Pacific region." The committee's report is now available for download.